For some its all about breaking records and winning back to back gold medals. 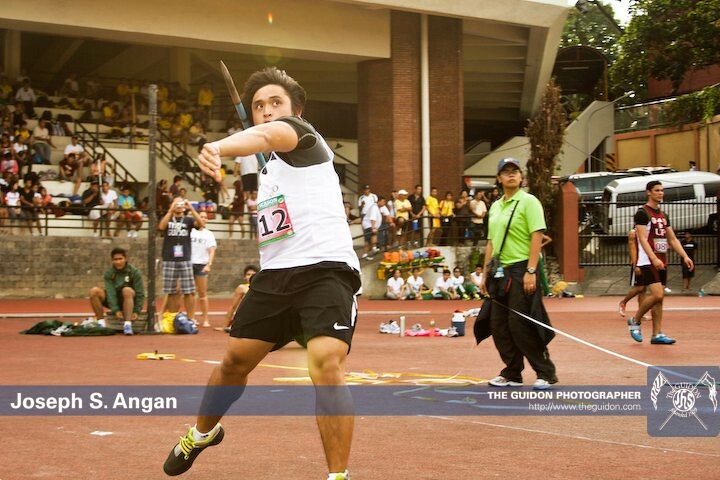 But the moment of last years UAAP came from Ateneo Javelin Thrower Paco Razon. Whose bronze medal was his first and last medal at the UAAP. Razon was eluded of a medal of any colour for his first four playing years but stuck it out eventually to be rewarded with a bronze which was as good as a gold for him. The Golden Bronze of Paco Razon. A pure example of perserverance. Although not a UAAP Champion, Paco Razon is part of a fabulous legacy of blue singlets. With such names as Arniel Ferrera, Eugene Benedict Tan, Ryan Dalman , Christopher Dominique Hey, and Micah Sibayan Ateneo has a winning history in the throws to live upto. 4 time SEA Games Champion Arniel Ferrera a legend of the UAAP. Photo by GMA News TV. A strong challenge however will come from Miguel Yuzon of UP whose hammer throw of 42.25m was #3 of 2011 behind SEA Games Champion Arniel Ferrera and his own coach and former UAAP Champion Karl Francisco. Certainly Ateneo’s Al Bugarin (37.52m) has his work cut out. Bugarin however is the leader in the Shotput (12.96m). While in the Discus FEU’s Joel Sta. Mina (40.25m) is the man to beat and his closest challenger Angelo Arayata (ADMU, 38.96m) and Ernie Sabidura (UST, 38.22m). Javelins leader is Razil Kasim (UST, 54.34m). 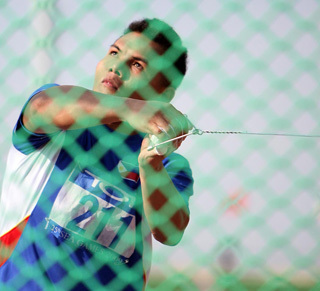 UP’s newest addition Palaro Record Holder and ASEAN Games silver medallist Stephanie Cimatu (42.34m) will undoubtedly prevent a FEU clean sweep in the womens throws. The 17 year old may have her sites set on the National Junior Record of former SEA Games Champion Rosie Villarito. The duo of Ferrera (38.70m), Jennefer Penepona (38.16m) are likely to feature in the top three with Cimatu. Penepona and Ferrera are trained by National Coach and former national team player Roselyn Hamero (Coach Rose). Stephanie Cimatu of IRAA flashes top form en route to defending and breaking her Palaro Record at Dapitan 2011. JUN MENDOZA. Cimatu’s team mate Precious De Leon (10.16m) will be looking to defend her UAAP title in the shotput. Aside | This entry was posted in 05 UAAP News and tagged Al Bugrain, Angelo Arayata, Arniel Ferrera, asian athletics, Ateneo Athletics, Athletics, Christopher Dominique Hey, discus, Ernie Sabidura, Eugene Benecdict Tan, FEU Track and Field Team, hammer throw, Hurdler49, Ira Mae Hernandez, javelin, Jennifer Penepona, Joel Santa Mina, Joseph Angan, Karl Francisco, Kenneth Grace Ferrera, Mary Jane Miano, Micah Sibayan, Miguel Yuzon, Paco Razon, PATAFA, Philippine athletics, philippine sports, Philippine track and field, philippine track records, Precious De Leon, Ryan Dalman, Shotput, Stephanie Cimatu, Throwing events, Throws, track and field, UAAP, UAAP athletics, UAAP track and field, UST track team. Bookmark the permalink.